Ha! Happy June! I got you first! And with it, please read Stan's column! I just put it up and I'm glad to share it with you. His picture made me giggle. Sourpuss! Read Stan's June Column, here! I want to tell you a story about what lurks in the forest around my house. There are some spooky happenings! This particular tail is the story tale (although true!) of the beaver. Each night after dinner, my dogs and I stroll along the river bank. Frankly, I usually take a fishing rod this time of year, but last night I just wanted to stroll along and enjoy the tranquil nature of the river. After all, it was growing dark already. 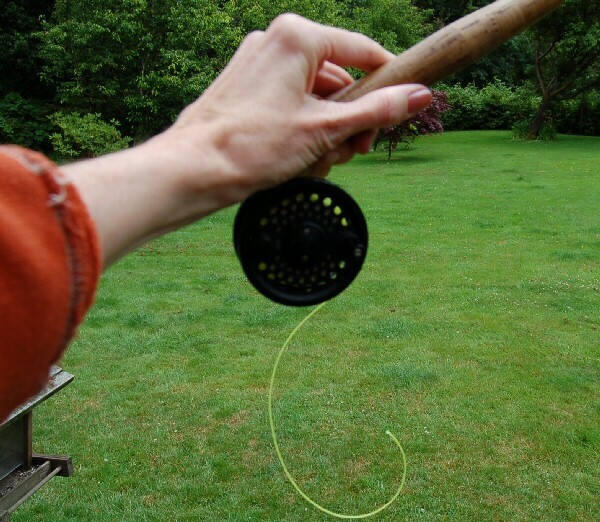 Perfect time for casting for cutts, actually, but I was without fly or rod. Bill has been cheating and throwing a spinner. I giggled at him, as he released one after the other, earlier in the day. It's fun to throw spinners for cutts, and it's good to know there are so many fish in there... that I'm missing with my flies! Ha! There is nothing more that I love than a warm summer's night. After my walks and before my bedtime, I've been enjoying the gathering of dusk from my upstairs balcony. This is where I tend to my portable green house garden and listen to the goings on in the bushes, surrounding the river. The sounds of animals bedding down, birds at their busiest, and some animals just approaching the night with new life is exciting. Sometimes I'm surprised by the crashing of elk as they cross the river, or the 'no sound at all' of a doe and her fawn, as they emerge from the surrounding brush and look up at me in equal surprise. I love that! Sometimes they scamper and play in front of me. It seems like they know I'm there, and put on a show. I try to stand still and not move as they make me smile. The hummingbirds become especially active at dusk and I have a feeder for them hanging by my hanging flower baskets, upstairs. If I'm wearing red, they mistake me for a big flower, and buzz me, repeatedly. My upstairs deck is a place that I love to spend my time. Every time my sons come to visit me there, they awe at the tranquility and remark on the peacefulness. All around us, the smell of fresh basil and thyme is all lacy in the air amidst the beautiful song, the sounds of the river. The buzzing of the birds highlight it all, and the lush and moist green of growing plants is heady and dizzying. It's a wonderful place to prepare for a long, summer's night's nap. Lately, though, mysterious crashes in the brush lining the river have surprised me enough to turn off my watering hose and listen and look. I see nothing, but I swear that I heard the falling of timber! "Bill, did you hear that?" But, no... he's busy watching television and didn't hear a thing. Hmmmm. Mysterious crashes in the dark... I turn my hose back on, and return to my work. So, last night I was walking along the familiar path. I can make my way, almost with my eyes closed, almost without vision by this time. I'm so used to the same old path, even with the changes in the river. It doesn't take long to learn the new channels that the river cut, last flood. The trail is ever changing, but all the same, if you know what I mean. The only things I really have to learn, which poses a danger for me is the large and changing holes that Kilchis proudly digs for me, and the bounding energy of Rev, who will someday, surely fall me as successfully as a logger falls giant old growth! Rev, with the speed of a bullet explodes through the tall grasses with nary a warning and so far, misses me only by her hair! It's a game she plays, I'm sure. How close can she get, without falling me? Or perhaps she is actually trying to fall me and misses only with her youthful folly and glee? Devil dog. She's out to get me! Regardless, my feet followed the path with expert precision, knowing just where the pitfalls of Kilchis were, and ever watching for Rev's explosive entries through the brush. As I continued on in relative peace, all of the sudden the world felt like it was coming crashing down on me! As I looked into the deep blue of the evening sky, I thought perhaps I'd taken too many medications and I was becoming dizzy? But, I swore that the trees were falling! Oh my gosh! They are falling!! Or at least "one" was! An approximate 15 foot alder was coming at me! Out of nowhere, the tip of the tree was approaching my head! I jumped back with the same surprise that Rev's surprise entries cause me and right before me crashed the Alder tree. It swayed as it settled. Likewise, my heart tried to land in the same place in my chest, and flurried back into it's normal rhythm. A wide open spot in the brush revealed three- foot tall stumps, chewed in half by nothing else but a beaver! I knew the signs! I'd seen them several times before, but never... never had I witnessed it happen! Right before my eyes! Where was this critter? How come the dogs hadn't noticed? I scanned the area for Mr. Beaver, but he was nowhere to be found. Sneaky devil! Carefully, I walked into the brush where the stump shot out of the brambles. This beaver was BUSY! Not one, but three trees-- chopped down to the stump, cleared and totally removed, except for the one tree that lay before my feet, ready to be drug away somewhere! I had noted in this area in the recent past, marks in the sand that I knew were a beaver, but I didn't know where he was working, or on what. I just wonder how many trees he plans on taking! These are the trees that we had so carefully planted to help the river bank. Darnit! The last tree he fell, Bill pulled into the water for the current to remove, but we found it later drug against the current into a home he's building, up river! What a busy beaver this is! Amazing that a foot long beaver has the capability of dragging a fifteen foot alder against the strong current of the Kilchis river! And what a shock it was, to have him work at my very feet, boldly falling trees, right in front of me! I can't wait to walk down to the river this morning. I'll take a picture of his clearing, and of the stumps and you too, will be surprised at the work he's done! I bet that tree is totally gone, too! Anyhow, that is my tale... The tale of the tail of the beaver that I have seen, imprinted on the sands before, and the reason for the crashing in the bushes. Mystery solved! I'm just so glad that this tree didn't fall on my head, or I truly would have been dizzy and fallen! It's funny to think, but that river is a dangerous place! I can just imagine the headlines. "Jennie, killed by wild, ferocious beaver!" If Kilchis doesn't get me with his holes in the sand, lethal enough to fall all but the most sure footed travelers... If Rev doesn't knock me over with his boundless and careless energy, (devil dog!) then by golly perhaps a beaver could fall a tree on my head! The Kilchis river is a dangerous place to live! Way back when I lived in a house on S.W. 3rd Street in Canby-- That's when I first learned to love a summer day with rain. I have so many good memories of rain in the summer, and the joy of those days, this feeling--have always followed me, through my life. I think I can pretty much pinpoint how it started. It was the absolute joy and excitement of having the rain dances we performed out in the strawberry picking fields come true! Rain! Rain! Is it raining hard enough to quit? I think that's also where I learned to jump for joy the highest! Along with several other young berry pickers, we'd jump up and down and scream, "It's raining! Do you feel it? Can we go home?" Day after day, we had spent long hours on our knees in the hot sun. Sticky hands, dusty hair, handing in crate tickets and counting them up on the way home. How much money had I made? How many clothes would I get to buy for school, after a portion of it went to the bank for education? Sitting knee deep between the dusty rows, the drops would collect by our knees and splatter in the softly tilled soil. A big, warm splotch would land on my jeans and quickly spread until the dots soaked us through and through. We kept our eyes glued on the berry boss for clues. It seemed like forever, before we knew which way she was thinking. You didn't dare ask! But, sure enough, (and joy of all joys!) as the drops became thicker, the old berry bus would sputter and chug to a start. In awkward lurches and abrupt stops, the driver, who was obviously not a real school bus driver, approached the front of the field and swung open the door for us to get in. Yes! We are going home!! That is probably my 'best of all' early memory of rain, but there are more. So many more! There is just something wonderful about rain in the summer. I have a great feeling of happiness, remember picking up my Aunt Dorothy Lee at the airport in the rain. She lived in New York, and brought with her treats from her land. The land of FAO Schwartz Toy Store, and fresh scallops from the sea! Have you ever watered a plant in the summer and even though you just watered it yesterday, it squeaks and cracks where the water hits the dry and parched spots? It's been so dry in the Kilchis valley that the whole world did that, last night until the raindrops soaked the trees through. Later, as the rain fell on the full canopy of green trees, there was a lush and tropical symphony, outside. What a concert! A solid, non stop hiss that made me wonder if the trees were strong enough to hold all of the rain that the leaves were collecting. I poked my nose through the crack in the sliding glass door and breathed deep, the wonderful clean smell. The rain was washing away all the dust, the pollen, and draining into the river and out to sea! The air was intoxicating. When I think of rain, I also think of sleeping outside in the summer, as a young girl. My Mom woke me one morning as I slept under a thick canopy of clematis on the patio. I can still recall the sound of the back screen door squeaking to open, and my Mom's voice, as clear and as beautiful as can be... "Jennieeeeeeeeee! Jennieeeeeeee!" Sleeping as hard as kids do, I didn't even know it was raining-- even though the drops were hitting me in the head and beginning to soak my sleeping bag! She excitedly began to tell me something special had happened and she wouldn't tell me what! I quickly got dressed, and we hopped in the car. Even in the rain, out of habit, I wore my summer flip-flops, and cut grass and mud collected on the slippery rubber under my feet. She drove me out to my best friend's house in Macksburg. Joni Harms waited outside her door, excited to see me. We walked out to the barn where a brand new baby foal had been born to the horse that we grew up riding, together. Miracles! Miracles in the rain! I remember long days of beautiful boredom, staring out at the town of Canby from my upstairs bedroom window, watching summer go down the drain as it was extinguished by a rare rain storm. Heat lightning struck, and I sat that morning, watching it, for hours. A magical peace and very rare contented boredom set in. One that I rarely feel, these days. When I was newly married and pregnant, a long hot summer had been interrupted with a fresh cooling rain. I ran in the house and said with joy and excitement to my then new husband, "It's raining! We get to wear sweatshirts!" It's fun to wear shorts and t-shirts, but it's better to welcome a sweat shirt and a pair of warm jeans and socks to our summer wardrobe. It just feels so good! Oh, socks on our feet! Yay! Pure, simple, easy joy. Joy that comes from the heart. Unadulterated, natural happiness... Rare and valuable and impossible to recreate. It just has to happen. The joy that only a lifetime of memories can buy. I feel that, now. I love it! There is just something wonderful about a summer rain storm. Although we get them far too often on the coast, as an adult, I feel the magic only when this nostalgia hits to match the rain. And now, I'm going to pull on a cozy sweatshirt and baggy jeans, and walk out to the river. I'm going to stand on the rocks and just smile. A million good memories come to me as I wait for the drops to play dot to dot on my jeans until they are all connected and a deep, soaking indigo blue takes over. Summer rain. Oh... good stuff. I still haven't taken the pictures of the Beavers logging site, but I will! I can't believe it! I count every day. He/she is up to 13 trees, now. Cut and cleared! There is an actual trail where he/she drags them down to the river. What a destructive critter! Bill and I are thinking of calling it into the ODFW for a live trap. I mean, these are trees by the river. Some that were planted, I'm sure, for the good of the river and fish habitat. I can't believe how they work. It's very interesting. I woke up yesterday with the strangest and most off feeling. I felt Fall in the air! Already! And my heart started to beat with this familiar happiness that reminded me of Fall Chinook fishing, brightly colored leaves and that wonderful feeling of wearing a sweater on a chilly morning. I love that! Darnit but I can never figure out what my favorite season is. I'm always looking ahead to the next one. All the while, I'm having a blast walking around my yard, checking on things that are progressing and growing. I have a good crop of blueberries coming on. Finally, for the first year, my raspberry project may yield success! I can't believe it! First we messed up and cut them back too far, not knowing what kind of berry plants we had. We fixed that, last year and just let them go. We didn't cut them back at all, and this year, we are yielding berries! Yay! The deer around here and I have been battling it out for years now. This year, I may just win! I have progressed from netting, to a four foot fence, to finally, a six foot tall, sturdy fence with a gate. It's the only way. If they get in this year, I give up! The other day I noticed that Bill left the gate open. Thank goodness they didn't catch our mistake. They so love the tender new shoots of raspberry plants! I have so many berries! I have actual strawberries that the chickens haven't eaten yet! They, too, are under lock and key in the fence! My freesia are finally shooting up. I have some that are 12 inches tall, and others just now sprouting. No blooms yet! I have my first nasturtium bloom! I grew marigolds by seed and they are doing great! My begonias are doing well but no flowers, yet. I lost all of my impatiens in the cold. I bought a whole flat at Costco and they all wilted and rotted. I was so bummed! I love those! I have 12 hanging baskets of flowers. OK, that's overkill, I know. But, I love them so and I grew them all from seed this year! Well, except for two. One I got for Mother's Day. My annual Fuscia basket that is always there for me like clockwork. :) You know, from the Fuscia fairy. I have 14 potato plants, and more coming up every day. There is nothing more fun that digging potatoes! It's like an easter egg hunt! There are dahlias coming up everywhere! One batch of bulbs rotted in the garage, but I got more! I have three nests of violet-green swallows and one barn swallow nest that we are watching. It is prime bird feeding time, and I have to fill my feeders for the goldfinch and the purple finch twice daily. (At least!) Man, they are little piglets! Well, it's off to feed them again. They are so cute! And when I go out to feed them, Mama olive green swallow sits in her house and talks to me about her babies. She is so wonderful! Very tame and such a pretty little thing! The hummingbirds who have decided to summer here, buzz me for fresh food. Sometimes, if I'm wearing red, they'll wait on my shoulder as I finish filling their feeder! There is a buzz of activity here and I love every minute of spring. It's my favorite season, you know... I think, anyway. Except for Fall.. and winter... and Summer. Well, it's off to pack my bags and leave for Portland. I hope to see many of you at the Old Market Pub and Brewery tonight! Won't you join us? I can't wait! I guess I'll leave by just saying, "Happy Season!" Aren't they all the best? Geez Louise. I don't know whether to be happy or upset! I'm happy, because I figured out what is wrong with me. I'm upset, because I've lost so much time, and I've felt so awful for so long! The local pharmacist changed my prescription and didn't bother to let me know. I'm on beta blockers. Toprol, (Metoprolol generic). I take it because they want to slow my heartbeat, as the fewer times my heart beats, the longer it will last. Plus, the slower it beats, and with less pressure, the less pressure it will put on my aneurysms. Anyhoo, I take 50 mg in the morning, and 100 at night. They had me on 50 mg pills. Well, the pharmacist saw fit to give me 100 mg pills without telling me, and changed my instructions. I'm so used to just grabbing the container and putting them in my pill boxes, accordingly, that I didn't even check. Usually, if they change my script, they tell me. You would think? The pills are very similar. White, scored pills. Anyhow, driving to Portland not too long ago, I fell asleep at the wheel. I've never done that in my life! I woke up as I was crossing the center line! Several times in the last months I have fallen asleep at the computer. Or, in bed, while I'm still drinking a glass of water, or reading. I wake up in the middle of the night, light on, with my glasses on and fully clothed! I have lost interest in keeping up my journal here. I have dismissed and not answered e mails from friends. I have just been severely exhausted! My heart beat has been really weird, inconsistent. My head hurts, I'm thirsty and sick feeling to my stomach. My eyes have been blurry. No wonder, huh? Oh, my gosh! I am so tickled that I figured this out! I hope I have better, and more awake days ahead! I've been so dizzy that when I rise, I nearly pass out. My hair has been falling out in chunks. Sheesh! Anyhow, the only problem is how to wean myself back to a normal dose. This morning I took a double dose before I figured it out. I ran out of pills this month, and couldn't figure out why. Doh! It's cuz they gave me half as many, and decreased my dose, but forgot to let me know! Here's to more awake days ahead! Fishing again! No more, "Bill, I'm too tired!" Regardless, I'm selling some Kwikfish. Not as many people ordered the last batch, and frankly, I'd like to let them go and be done with them. They are beautiful! If you are interested, please contact me and let me know. Oh! And here is the Beaver Clearcut! There are two new Kwikfish in the works, a K-15X and K-9X. Both models are patterned after successful models K-13X and K-11X. These are stable, deeper running models that can withstand faster, more turbulent water than their predecessors, and will need no or little tuning right out of the package. The K-15X is designed to run up to 16-18 feet on a flat line and the K-9X up to 10-12 feet on a flat line. These new lures do NOT automatically replace the old K-9 and K-15 Kwikfish. The K-15 Kwikfish is the best selling size, especially on the West Coast, and our company is not going to risk upsetting an item that is a leader in the market. We will sell both models and let the fishermen (fisherpersons) weigh-in on the subject. As with the K-13X and K-11X, we feel we have winners in the two new models for next season. These should be available on the street in the late fall of 2007. It's way too beautiful out, this morning. I'm playing hooky and going fishing! I'll let you know how we do! The sun is shining, the grass is green. In the forest, the spruce trees sway... There's never been such a day.... Let's go fishing on Tillamook Bay! But it is finally the 12th of June... and I am longing to catch one soon!!!!!!! and I'll be fishing way past noon! May your days, be merry and bright! And may your days be filled with fish that bite! Oh well! No springers, but man! What an awesome, most beautiful day! It was so sunny and warm. Not a breath of wind in the air! I love fishing in sleeveless blouses. I simply must go to Mexico and fish in shorts. I just adore fishing in the warm summer! And Marie at Tillamook Bait? I've been thinking about you! How are you? Write me! "Dad wants to go and take the drift boat! You should go with him!" My sister told me over the phone from the Black Butte family reunion. I didn't attend, this year. I'm sure I'll hear about it forever. Jennie didn't go! I'm in big trouble! But, Diamond Lake? I'd love to! I love Diamond Lake! So much so, that I wrote a whole story on it at the very beginning of ifish! Read it, here! I feel like my life, my birth, my growth revolved around Diamond Lake! I went through childhood, puberty, young adulthood, all at Diamond Lake! I went from swimming to fishing to riding bikes around the lake, and finally, to climbing Mt. Thielson! Tada! I still have memories of all of it that are vivid in my mind. The sandy cold floors of the cabin, before breakfast-- and I can still feel the rough boards of the dock, as my cousin and I padded barefoot to the Diamond Lake resort store, to look at souvenirs and purchase a bag of penny candies! I can still see my Grandmother with the binoculars, searching the lake and finally saying, "Oh! Here they come! I better get dinner, going!" There were boats in every slip at the dock and we'd all stop to ooh and ahh and pretend we owned the nicest ones, as we walked to the lodge to play spoons. That's a card game where we got way too wild, and spoons would fly everywhere. It's a wonder no one got hurt! Clear to the kitchen, the spoons would fly! It was really difficult to explain to the lodge restaurant why their spoons were bent in half! I miss Diamond Lake so much! For years, every year we'd load up the camper and go!, It was the vacation of the year, something to look forward to with every passing season. What a family tradition! It is things like this that bond families forever. Black Butte too, I suppose, but somehow, I've never graduated past Diamond Lake. I miss that part of my life, so much! Diamond Lake is also something that bonded me to Bill Monroe's writing. I'm really excited that Bill has begun a web blog, online. He's great to read and if you like fishing and hunting, well, it's a no brainer! You can reach "The Birdsnest" By Bill Monroe, by clicking the highlighted text. Bill has always held a great interest in Diamond Lake. I'm sure that if you read The Daily Oregonian, you didn't miss the full spread on Diamond Lake. I found this by doing a web search: "Diamond Lake trout catch provides time capsule." Oh! And Mark Freeman of the Mail Tribune recently wrote in his popular web blog about Bill's recent fishing trip to Diamond Lake. What a dandy picture of he and his wife, Glenda! The site popped open and immediately after, so did my smile!! I wish I could get a larger, blown up copy of that, so that I could keep it on my desktop. That's Diamond Lake! That's Bill and Glenda! ...and these are a few of my favorite things! While you are at it, bookmark Mark's "Fish Hack" weblog. It's a great read, too! Well, I'm off, but I'll tell you, my mind is full of memories of Diamond Lake, now. It makes me smile. I've got to get back there. I think I'll call my Dad, now. :) I wonder when we'll go! Darn good thing that my Dad doesn't have the internet, and I'm betting on-hoping that my brothers and sisters won't tell. After all, they are a part of it! I am sneaking out to surprise my Dad for Father's Day. We are going out to breakfast, and then to church. I hope he's surprised, and I hope he isn't mad at me for not going to Black Butte this year. After all, I was sick! I couldn't go because of the beta blocker mix up. It is such a long drive. The kids couldn't go due to school, and I really was afraid to drive that far by myself. Anyhow, I can't wait! I'm trying to get my ifish work done, so that I can get out of here, and maybe do a little shopping for him, before hand. Kilchis and I are going to go out and fly fish, first. I just wish I could take my Kilchis. You know, his nick name lately, (they change) is Mr. Cutes. Oh, how I love Mr. Cutes! !-- and is he EVER cute! I swear, that dog poses for cuteness. I think he thinks about it all day. "Let's see, what look on my face, what body position will make all the people fall in love with me?" It works, too. Every single position, every facial expression... well, he's Mr. Cutes! It just kills me to leave him, every time. 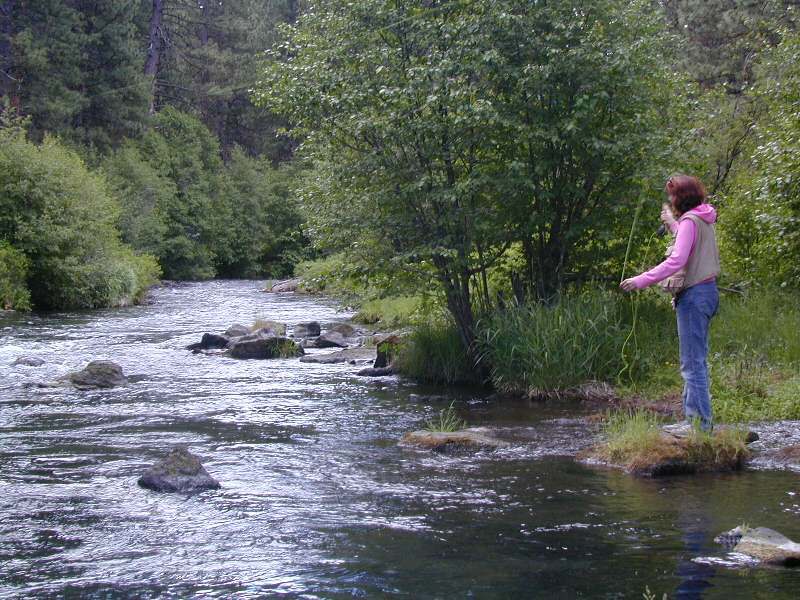 So, on that note, I think I'll grab my fly rod, and head out to the river. Will he ever have a cute look on his face, then! The excited, wiggly Mr. Cutes! The fishing Mr. Cutes! There isn't a cuter dog on this earth! What a fine late spring/early summer morning. It feels like fresh strawberries, out. I was noting how many berries we have, on the horizon. Blueberries, raspberries, strawberries and blackberries, soon! --all gradually ripening. Oh! And blackberries, too! Look out for pie days, ahead! Not only that, but the wonderful feel of wet grass on my sneakers as I walk out to get them! I hold dear my Grandmother's tin berry picking bucket. That bucket holds as many great memories, as it does berries. Mondays are always crazy, but this one seems especially so! My computer is crying a strange moan. I think I'll clean it out, today. The fan keeps amping up and down. The bad thing is that sometimes when I clean my computers, they don't work afterwards! Please bow your head in prayer! I certainly don't need excitement like that in my life. I had a wonderful trip to Portland, although I always pay for these kinds of trips. I'm exhausted! Perhaps that's why I feel behind, and a bit out of sorts. The fish are waiting for their morning fly, but they'll just have to wait a bit more. I don't know who is more eager. The fish, or my dog, Kilchis. Kilchis presently has his adorable head on my knee, impatiently waiting. "Mom, let's go fishing... please, Ma? Now? Can we go, now? Look how cute I am, Ma... now?" Whoever said beauty doesn't buy you anything has never seen Kilchis. That little dog gets whatever his cute little heart desires! Man, is he ever cute! My Dad was so glad to see me. The look on his face when I walked into the Homestead restaurant was priceless! I love my Daddy-o! It's nice to sit next to him and hear his voice and feel his warmth. He's a wonderful man, and I miss living close to him. Life is so short and I'm forever thankful for each day. My sister is an awesome person. As she hugged me as we left from church, I felt a bit of a sup-sup coming on. She loves the Lord so much that she just glows. Each time I see her, I wish a little bit more of that to rub off on me. Anyone that is that happy, no matter what the belief or reason is to be envied. She's found it and it's the old, "I want whatever she's having!" Sometimes I read ifish or other web sites and I see the anger and bitterness in people's hearts and I'm so sad for them. What happened that they are so angry? So mean to others... so quick to judge. The kids point out quickly when I'm too fast to judge. I admit it creeps up on a person, as we get older, but try, try try... try to fight the urge! I have trouble with church, frankly. My emotions get the best of me at times, and sometimes when something really touches me deeply, (that happens often!) the tears flow freely. Problem is, tears in church, in public anywhere... I'm just not comfortable with! I want to be strong and smile! Why does it come out, tears? I had a girlfriend once who refused to go to church solely because of this. -Yet she was 'on fire' for the Lord like no one else I knew. She just gets too emotional. I can relate! I hid my face as the tears came on after one or another praise songs that hit my heart especially deeply. Anyhow, what could be better? I spent Sunday touching arms and hearts with my family in church. Life is wonderful. Isn't it? My Dad's girlfriend attended, too, and it was nice to get to know her a little bit better, each time we meet. What a nice lady! So pleasant... so nice to my Dad. Anyhow, it's off to the showers for this girl, and then, Kilchis, yes... we can go tease the cutthroat with the flies. I hope the mid morning bite produces something grand for us. I'm in the mood for a tug and a giggle! It's girly day! I can't wait! Have you ever heard of a hair appointment at 7 AM? My stylist is a farming girl. Can you tell?l! Up early, so she can get the cows in before dinner! So, I'll be stylin' by 9 in the morning! I wish I could get my toenails painted! That always makes me feel so good! I haven't had that done in ages! The day of my dreams would be to get my hair done, my toes painted, and then a massage... AH! After that, out in the boat to hook a salmon! Dreaming of luxury and all the best (! ), this fisher girl is! Just goes to show you guys that we do exist! And some women would enjoy a new trollin' motor! You can find a girl that likes to hook a salmon and be a girly-girl, too! I'm no sissy. I can back a boat, and bonk a salmon with the best of 'em. But, I can also be feminine and enjoy the finer things in life. And what a fine life it is! Good morning! Off I go! I'm just hanging around, watching the birds. I have goldfinch, a whole happy family of them, not a foot from my typing hands. I love it! The grosbeak are also there, feeding their young. There is a family of tree swallows learning to fly in the air just outside my window. They are flying in circles, and then going back to their house, which is on the wall, outside my window. New life! They are all so excited! Yesterday my internet connection was down all day long. At first I found it frustrating. After a while, though, I put on my swim suit and went to soak up some sun. (laugh). It wasn't too hard. I forced myself! Ahhh.. It felt so good to have my body all warm, all over. When I got too warm, Kilchis and I wandered down to the river to touch our toes in the cold, clean Kilchis river. Look out for crawdads! The thought of one of those grabbing onto my toes still haunts me! I'll never forget getting stuck on a sandbar in the salty bay with my family. My Dad made the girls get out of the boat, barefoot, and push! He teased us about crabs biting our toes, and it haunts me, still! 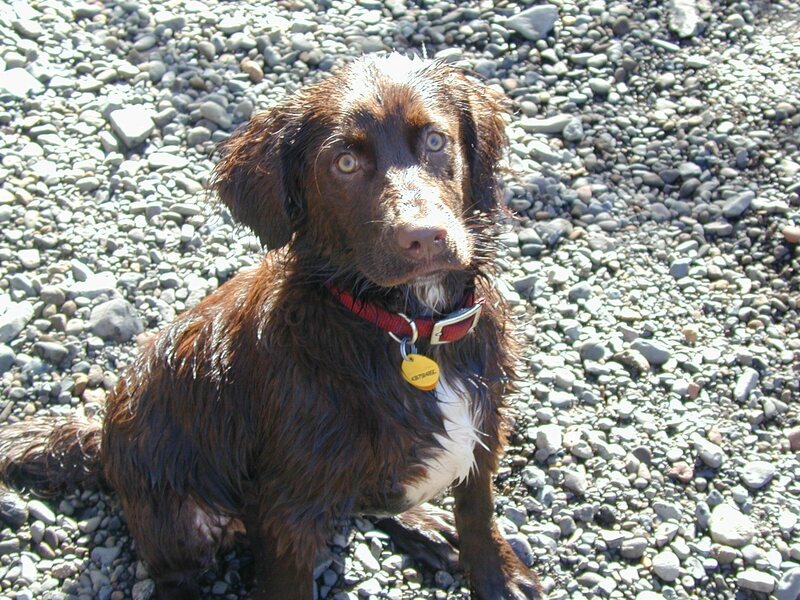 He did the same about swimming in the Molalla river. "Look out for the crawdads! They'll grab hold of your toes!" No wonder I have a thing about critters biting my toes! For some reason, this brings home the memory of something I did to my sister. Shame on me! I was down in the basement playing when my sister was told to go down to the freezer to get something for dinner. She didn't know I was down there. I quickly turned off the play room light, and hid under the ping pong table. When she opened the freezer, I grabbed her ankle! How terrible of me! The scream that came out of her still makes me giggle, but man! How mean can I be? That must have been terrifying to her! Still, as I write, little giggles escape me from the naughtiest part of me! Off I go-- I think I'll go out and tease some cutthroat, now. It's about equally naughty, when you think about it! Maybe that's why I giggle when I catch them! It's done with one thing and onto the next. Ifishstock! This year, it's August 25th and we are celebrating it during the chinook week at KOA in Warrenton. Be there! It's your big chance at B-10 to land and keep a big fall chinook! These are good times and ifishers are getting together to eat alot of food and to celebrate! It's like our Thanksgiving. People bring tons of food, seafood and salads, pies and cakes and just have a good time! There are prizes to give away and music and it's the time of year to put a face to a moniker and shake their hands. A bunch of us are staying overnight. I've reserved a line of camp sites and RV spots under ifish's name. If you wish to take one, please call KOA at l (800) 562-8506. Tell them that you'd like an ifish RV or camp site. The cabins are all taken. In fact, I rented all four cabins they had left, and gave them out, forgetting that I needed one. Doh! So, I am cabinless. I guess I'll stay in town at the Shilo. If you don't know what ifishstock is, please read this thread. WHAT: A family BBQ and party, B10 fishing and clamming on the beaches! WHEN: August 25th, after fishing and until darkish! This is the one time of year that we allow everyone to advertise their wares on a thread, if you promise to send a sample of your product for the prize line up. We do door prizes during the party, just for fun and to introduce the sponsors and the non sponsors products. It's all about getting to know you! Click here if you have a prize to donate to ifishstock! Anyhow, I'm going to go fishing in a lake for bass, pretty quickly, so I need to get off the horn, here. Have a great day! It's gray, drizzly and dark out. Perfect for fishing! Off I go! Yesterday, Bill invited me to fish a lake that the Oregon Fishing Club has access to. I love to lake fish and I hadn't for a while, so I said yes. However, I just wasn't feeling well, yesterday, and ended up staying home as he drove out of the driveway with the canoe flagged out of the back of his pickup. I rested for a while, but Kilchis really didn't need to rest. He was letting me know that, quite clearly and constantly. He wanted to fish, to run, to play! I finally rose from my resting spot, put on my boots and grabbed my fly rod. He was ever so excited! Rev and I and Kilchis headed for the river. Rev raced around in circles in approval, and Kilchis flew down the river, ahead of me chasing a dipper. I felt better, already. They were right! The fish were biting, too! I was releasing fish after fish on my favorite purple joe fly. Oh, I love this fly! It's caught me fish from the first year I taught myself how to fly cast. I have come so far, since then, and my purple joe held strong. I haven't even had to repair it. It was still in beautiful shape. A couple tail hairs missing, but no worse for the wear. I've carefully removed the barbless hook from many an eager cutthroat and they still take it, quickly forgetting that this fly isn't real food. They take it, just the same, day in, day out. I do wish I could tell if the same fish have taken this fly, more than once. I often dream of tagging birds and fish alike. I know it's not a possibility, but still, the idea interests me. I stare out the window and wonder, "Has that hummingbird been with us for years, or is it new?" Can you just imagine a little tag around he's wittle footy? Anyhow... back to the fishing. "Man, have I ever learned to cast. I'm good! Really good!" I said out loud to myself. I'm certainly glad I'm all alone out there. People, if they listened to me, would think me quite nuts. I've been caught in the past, singing way too loudly on the river, thinking I was alone. I sing love songs to my dog, love songs to my river, love songs to the earth... Yep... I'm nuts. I can really shoot a fly! I held up my rod and reel and just burst out laughing! My line, like a streak of yellow lightning flew across the river, with no hold on it! Ever felt like that? Just in pure wonder and shock at something so stupid that you'd done? That frozen, mouth open, in awesome wonder-feeling of, "Oh, crud! Did I do that?" My line had suffered a crack in it many years ago. I suppose that it happened someday that my line, bundled up at my feet, got caught in between rocks and I pulled on it, out of frustration. My line, hence, sported a small fissure which over and over, held up through many, many battles. But, now, today, it split land flew like a rocket! Like an arrow through the sky, it shot forward like the Mother of all Mothers of casts! Talk about a perfectly loaded cast! There flew my favorite purple joe fly with a yellow streak of lightning following it! And I, left holding the curly end of the line, stood there. Just me and my river, and two laughing dogs. Me, my mouth wide open in shock and out comes a belly laugh like no other. Then it hit me. All laughter ceased. I want my purple joe. I want it badly. The thought crossed me to swim, but it was raining and cold. Still, I really considered it. I love that fly--so much that I would die? Swimming in the cold... was I that bold? The fact is, however, that the fish were hitting one after another on that fly, today. Surely, some innocent fish would take it, and swim around for a while, with that hook in it's mouth and a yellow stream of line, following it. A fish on a lead? That's not what it needs! So, I followed the current down. Oh! My vision! I wished that I had better vision, so that I could find it! It is neon yellow. Should be easy to see, yes? I walked all the way down to my collecting spot, probably a couple city blocks downstream, where things usually gather in a side current of lost and found corkies, bobber pieces and flotsam and jetsam. No line to be found. None at all. Oh, where, oh why was my purple joe fly? Got back up a while later, and headed back upstream, searching with my feeble eyesight, the current, the eddy, the top and bottom of the water. Back at the deep pool where I fish, I spotted it, circling in the current, bobbing up and down, a wadded mass of neon line. "There it is!" I shouted. Kilchis looked at me like I was nuts. An idea! I walked back to the house, and grabbed a spinning rod with a large treble hook. I'd hook it and get that purple joe back, if it was the last thing I'd do! Panting, I headed back down to the river. The dogs did not complain. Two trips in one day? Unheard of! Joy of all joys! Losing that line, seeing it fly across the current, free as the breeze, was the same darn feeling that I had, one Fall. I was sitting in a boat with a half dozen hand picked Kwikfish around me. They were waiting for me to decide which one to decorate with a slab of sardine, and tune perfectly to go into the current to fish out a salmon. I finally decided on one, wrapped it with care, took pride in scenting it just so... and forgot to tie the gosh darn thing to my leader! I threw it in the water with total abandon, waiting for it to start to dance. Dance, it did not. That exact same 'mouth open' horror followed by a gut wrenching guffaw and giggles as it floated downstream, free as the breeze, uninhibited by line or rod. Bye bye, Kwikfish! Maybe I'll find it this morning in that collecting spot of mine. I just hope to heck that I find it, before a fish does! Of all the things I've found in that puddle of fish debris... I've never, ever found a Clarki clarki from up at the parky. Oh, my! If life got any better, I don't know what I'd do with it! I'm having a good hair day. I put fresh strawberries on top of my newly found breakfast favorite. Tillamook Yogurt and Bear Naked granola. Oh, yum. It's to die for just alone, but add fresh strawberries, and ... you'll just plain be in heaven! The sun is shining. The only thing that could happen better is if I were to win something for a ridiculous price on ebay, (one of my favorite downfalls in life) and/or if I were to find this brushed gold disc necklace that I was waiting for it to go on sale. By the time it went on sale it had sold out. I cannot find that same necklace anywhere! It doesn't exist! I don't buy jewelry, but I just loved this necklace! I would not pay 50 for it, but I would have paid 20! Now that it's gone, though, I think I'd pay 100! See how that works?! Anyhow, I'm going to lunch with my girlfriend and afterwards, Bill and I are going to go cutthroat fishing. To top it off, (no pun intended) I bought a new sun hat at Freddies for 9 bucks and it's perfect for cutthroat fishing! I'm happy. It's time we all gather on the back deck, surrounded by my beautiful flowers, (that I planted from seed this year, thank you very much!) and just soak up some sun. Life is so good. Oh, Thank you, Father! Every day is a blessing! God wants to give us everything our heart desires. Isn't that awesome? I am really excited to go to ICAST this year. STGrule is going with me. We enjoy the first night at the new product contest, and I just can't wait! All the major fishing companies introduce their newest products! I always learn so much! We will be staying at the Las Vegas Hilton this year, as we did the last. The options to stay in Vegas are great, but if you are with a convention at the Las Vegas Convention Center, you really can't go wrong, staying right there on property. We will be doing a web blog live from the Hilton and may even do a live web cast, so starting July 10th, keep a look out for something different at ifish! I have been working on, and keeping notes on properties that I stay at for conventions and fishing related travel. It is my dream to have a directory as to where best to stay and reviews on hotels. I will get that posted, asap! Off I go. I think I'll do a little fly fishing this morning. Sound good? Thought so!